Proactive and passionate producer with over 4 years of producing experience. 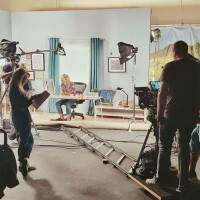 I have produced branded content and ad campaigns for various agencies and clients such as Boots No7, P&O, Mail Online, Lego, Pandora, Robinsons, Huawei, Sanofi and MSD. My experience is mainly within producing branded content but I would also like to use the experience I have gained thus far to work on a few more factual and documentary projects so am actively seeking positions PC/PM roles within this particular area. I can confidently organise all aspects of a shoot (inc complex shoots), lead on small to large projects from conception through to delivery and have experience in directing small and big crews. I am able to scope briefs, manage crew on loc/source locs, manage child licencing, coordinate travel and accommodation, sort out permits, write up all necessary documentation (call sheets, treatments, contracts, schedules and maintain reports etc etc), able to lead and motivate a team, cast, able to cost and manage budgets of all sizes and able to negotiate and control production expenditure. I am an enthusiastic team player who thrives on running busy, often complex multiple productions. I have visual flair, am a creative problem solver, have a lot of resilience but equally a good sense of humour. As a tin box travels along a pulley wire, on its journey we notice the in between moments of the residents living and sharing a square. Directed by Beatrix Blaise with help from One Stop Films (supplying us with 40ft crane, kodak camera gear, 35m film and a grade). Combining our poet reading the ‘Ode to Empowering life’ featuring UGC footage from patients projected on to projectors. Produced an ad for Robinson’s in Brighton advertising Robinson’s new cordial with collab from Brighton Swim Team. Produced a large video campaign that focused on three celebrities encouraging others with heart disease, diabetes and asthma to get free flu jab. Sourced all locations, costed the entire project and managed the budget and sourced crew and some cast. Produced a 2 day shoot with up to 15 locations across Kent. Costed the entire project, managed the budget, sourced all crew and cast and sourced all locations. Drama currently starting its festival run. Featuring James Anderson (Holby City) and Fiona Hampton (Kingsman: Secret Service). Produced a 4 day shoot across the UK and Scotland. Sourced all locations, managed crew, and costed and budgeted the production. Featuring Jason Bradbury (Gadget Show). What do a mountain rescue volunteer, a skateboarder and an anti-gravity yoga enthusiast all have in common? They all work at MSD, and they’re all driven by a desire to improve the lives of patients, their families and their friends. The video shares our purpose, ‘Inventing for Life’, and celebrate our greatest asset – our people. Create a promo for the Build to Give campaign for LEGO for online purposes. No7 partners with inspirational women to celebrate the confidence boosting power of cosmetics. Freddie Harrel, Zoe de Pass and Olympic fencer Monica Aksamit share the internal power and energy that make-up gives them, giving them the confidence to be READY FOR ANYTHING. Run Run as Fast as You Can is a short film that follows five children who are being hunted through the fading light. Who is chasing them or for what is unclear. All that is obvious is their fear at the prospect of being captured. The youngest of the group, Elliot, is slowing the others down. Will, Pete and Ian want to leave him but Jill, the oldest, can't. Even if it means being caught herself, some bonds can never be broken. They will stay together come what may. A relentless chase with a meteoric twist for young and old alike. Cami Lamont-Brown, Oliver Ebsworth, Joe Grant, Leo Montague, Jordan Clancy, Johnny Vivash, Paul Dewdney, Sam Blake, Sam South and Alan Mandel. Following the death of his wife, a depressed father discovers that his son is gay and confronts him with explosive consequences. Crossroads: 32 Film Festivals, nominated for 16 awards, won 12 awards including Best Drama, Best Screenplay, Best Short Film, Best Supporting Actor and Best International Short Film. Picked up distribution with Shorts International whilst at Cannes and later distribution with a NFP Organisation in France to help combat homophobia. Crossroads also competed at the world renowned Torino Film Festival in Italy. Run Run as Fast as You Can: 6 Film Festivals thus far, won Best Drama at LA Film Awards and is nominated for two more. Screened at two BAFTA film festivals and currently being considered by BAFTA. Father: 45 Film Festivals thus far, won various awards including Best Film, Best Child Actor, Best Horror, Best SFX Make Up and Best cinematography. Will be screening in Jan 2018 at the prestigious LSFF.